A friend asked for help as she wanted to dye one kilo of handspun woollen skeins all the same colour. Dyeing such a large quantity of fibre is not easy, unless one has suitable equipment. I don’t have a pot large enough which could be heated and I no longer have a large Burco boiler, so the only option seemed to be to use a plastic container and opt for cool dyeing. Cool mordanting with alum is not a problem, as long as the fibres remain in the cool mordant bath for at least 24 hours and preferably longer. However, cool dyeing limits to some extent the dyes which can be used, as not all dyes can be successfully applied without heat. To achieve this colour, I decided to apply an alum mordant and then dye with weld extract, followed by indigo. I already have a large plastic container I keep for alum mordanting and fortunately it was just large enough for the quantity of wool, so I filled the container with cool water, added the alum mordant and left the yarn in the mordant bath for a couple of days. I decided to use a large plastic garden trug as my dye pot, so I dissolved the weld extract in boiling water and added it to the cool water in the plastic trug. I stirred well and then added the wetted-out yarn and allowed it to steep in the dye bath for about 24 hours, by which time it had become a suitable shade of yellow and was evenly dyed. The final step was to make an indigo vat, also in the large plastic garden trug. The wool was then over-dyed in the indigo vat. Although the trug seemed large enough for the quantity of wool being dyed with weld, I think the wool probably needed even more space in the indigo vat, as the results were somewhat variegated. However, the colour on the sample was also variegated and my friend was pleased with the results of our labours, so all was well. 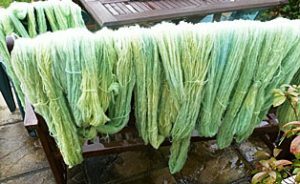 I then decided to dye a further kilo of wool, this time Romney Marsh fleece from local sheep, processed into yarn at Diamond Fibres in East Sussex. I wanted a colour suitable for a jacket that I could wear with most things and as I would have to dye without heat I chose to use buckthorn bark, which responds well to cool dyeing and which would, I hoped, give a caramel colour. I simmered up about 200gms of buckthorn bark and then strained the dye liquid into the water in the trug. I added about 1 teaspoon of walnut hull extract in the hope that this might make the shade slightly browner in tone. (However, my initial feeling that walnut might not dye well without heat probably proved correct, as there is little evidence of any walnut influence in the final colour.) I added the wool skeins, which absorbed the dye more quickly than I had expected and I removed them after about one hour, rinsed and washed them and then left them to dry. These skeins also appear variegated but not this time because the trug was too small for the yarn. Buckthorn bark tends to change colour a little when left to dry in the light and it is important to open up the skeins and move them around, so they dry evenly. 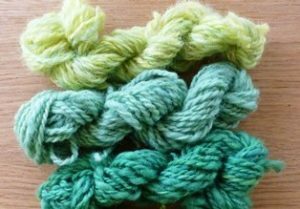 However, because the skeins were so dense and thick it was more difficult to open them up, so the final colour effect is variegated. Fortunately, I like this effect anyway and, although I had been aiming for a more caramel tone, I am also pleased with the colour.